A wood router is a common woodworking tool, as well as commonly used. The five best wood routers reviewed and compared. If you need to route wood, create beautiful, well finished decorative pieces or precision edge woodwork, then you'll need the best wood router for the task. There are plenty of models available, many of which are of the type and quality that will stand up to a hard days work. I possess several and though it's possible to use some of the old methods to achieve the same end, I prefer to have a tighter turnaround and a happier customer. I use both a plunge router that's mounted on a router table, and a hand held, both equally capable of doing what I need them to do. I generally recommend the bench models if you're indoors more than you're mobile, or for those that enjoy woodworking as a hobby or they're home improvement enthusiasts. Featured below are the five best wood routers. Good value for money, they're highly rated and well put together power tools. The Porter Cable name is usually synonymous with rugged, quality power tools. In the case of their 11 amp wood router, I'd say that they've got it right yet again. It's not the most powerful model under the brand name but it's certainly good enough for both the average DIYer and the more experienced woodworker. It feels solid, it runs over (or around) a jig with the same ease that you operate it with and it's one of those routers that most folks buy more than one of - then set up to perform different tasks. It's a breeze to change bits, its design is basic yet effective and it's often the tool of choice for most pro guys. Does everything you need it to do, equipped with all the usual bits and pieces and for the money - highly recommended. This is the best selling Bosch wood router overall and yet it's not every one's favorite choice when it comes to getting down to some serious woodworking. Some find that it works over the size you set it at, which ain't what you need in a pro workshop. However for the amateur it will stand up to what you need or expect of it. It does perform well overall, it's relatively quiet, pretty comfortable to operate and even the most unskilled should be able to work with it. You'll probably find what I and many others discovered when using it - it works better fixed than it does in plunge mode. Still, it is well made, it's durable and it is pretty versatile and easy to use. If you're looking for a non-complicated entry level wood router, this one will do. If you want something a bit more reliable, go for the Porter Cable. 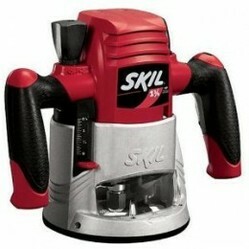 This is the best cheap wood router, a reconditioned model from the Skil brand name. I like Skil tools, they're a robust manufacture and generally up there with some of the better pro brands. This is the one for those that don't have a mega bucks bank account but need a good quality cnc router that works, delivers and performs a wide range of tasks. In all it's a lightweight router, suitable versatile and good enough for the home workshop. The bits change in a snap, it maneuvers with ease and though it's only powered by a 9 amp motor, it's enough to meet the amateurs needs time and again. Despite it being a recon model, it still comes with a 12 month warranty and if you're looking for an above entry level router for under 50 bucks, you won't go far wrong with the Skil 1810. This is one of the best wood routers for sale, not least due to the power it puts out and its ability to deliver quality work at the professional level. It features plenty of bells and whistles, all of which do come into play when you're using it on a regular basis. It's well made, well designed and plenty solid overall. I like the soft start, the way it works as comfortably with hard woods as it does softer pieces, and the fact that it's a reliable smooth operator. It will take just about any router bit you can think of using and, despite the power it delivers, the soft start and variable speed work well together and effect a good level of control over the router and the pieces you're working on. Good quality, sturdy and efficiently designed, worth every cent. This is a small, portable wood router, so don't buy it thinking it's cheap and it's going to be up to working on bigger pieces. Where it does works well is on edging and detailed work and it's particularly good for anything that you can perform one-handed in a mobile environment. For what it is, it's well made and durable but, the minute you start expecting it to stand up to heavy duty wear and tear you're going to find it wanting. If you're wanting a model that can stand up to the bigger stuff, the simple answer is that you buy a bigger, more powerful model. For it's size and capabilities, this is a great little router. Self-releasing collet, soft start, the depth adjustment is rapid so overall it's a nice, user friendly small woodworking router.